Earlier this week the first block reward halving for the Litecoin (LTC) has happened and although there was a bit of uncertainty about what exactly will happen with the alternative crypto currency it seems that things haven’t changed much actually. 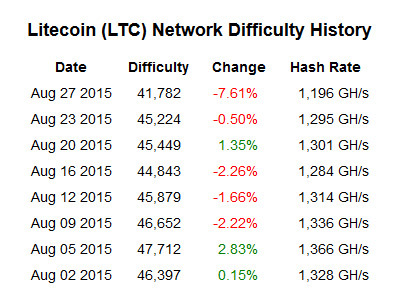 The exchange rate of 1 LTC is still hovering around $3 USD or a little lower, but the network difficulty is going down in order to compensate for the decrease in half of the mined coins. So it seems that no imminent price increase is going to happen, but instead the network difficulty will go down because some miners with older hardware are apparently turning it off as it may not be able to even pay for the electricity used. This simply means that things will balance in a matter of days.